Marine Corps Base Camp Pendleton is the Corps’ largest West Coast expeditionary training facility. The Base encompasses more than 125,000 acres of Southern California and houses more than 38,000 military families. Located approximately 38 miles from downtown San Diego and 82 miles south of Los Angeles, Camp Pendleton has been the largest employer in North San Diego County for more than 60 years. As one of the Department of Defense’s busiest installations, it offers a broad spectrum of training facilities for many active and reserve military units as well as national, state and local agencies. It also provides specialized schools and training. Since Camp Pendleton contains the largest undeveloped portion of coastline in California, protecting the wildlife and habitat is imperative to its mission. During a recent expansion, a new, four-story, 500,000 square foot medical treatment facility was constructed. The $455-million replacement Naval Hospital Camp Pendleton facility is a medium-sized, teaching hospital that provides outpatient and inpatient care for active-duty service members, retirees and other eligible beneficiaries around the clock. During the construction process, a 24’ x 8’ CON/SPAN® B-Series Bridge System, 132’ in length, was utilized for its ability to avoid the waters of the U.S. stream delineated area. The structure was designed with a slight curve in order to remain out of the way of the meandering stream. A 40’ x 6’ Continental® Connector® Truss Bridge was utilized to provide pedestrians access to the hospital. The truss bridge was manufactured at a plant in Alexandria, Minnesota and then shipped to the site in one piece where it was lowered into place via a crane. After installation, a concrete deck was poured. 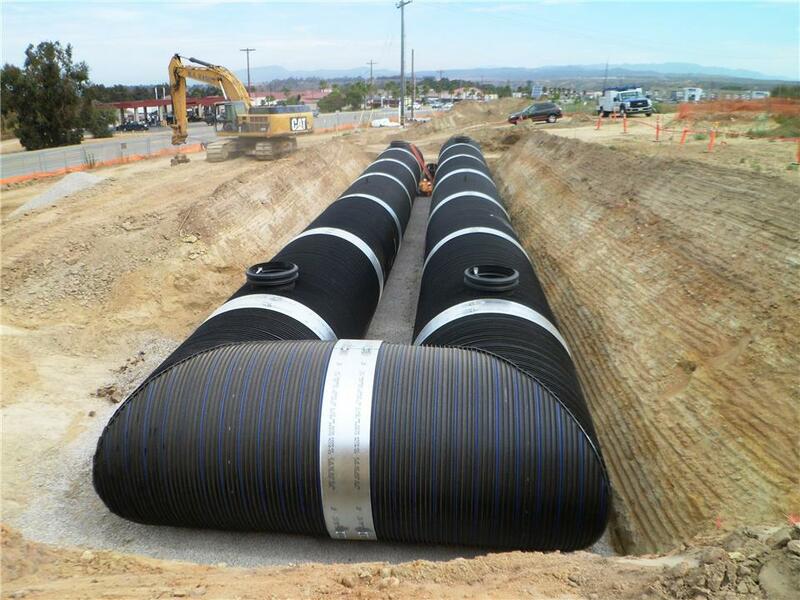 Lastly, a 120" DuroMaxx® Combined Sewer Overflow (CSO) System, 240’ in length, was utilized as sanitary sewage storage. The Navy was required to be prepared for the potential shutdown of their wastewater facilities for four days after a large seismic event. In order to meet these requirements, the watertight Duromaxx CSO system was designed to store waste until the system could be repaired. The cost of the DuroMaxx CSO system was much more economical than the originally designed cast-in-place system. In fact, the waterproofing alone on the cast-in-place system was almost as expensive as the entire DuroMaxx CSO system. DuroMaxx was also selected for its watertightness and the layout flexibility it afforded. "The DuroMaxx tank was an economical choice," stated Wes Brodeur, with W.A. Rasic Construction Company, Inc. "I also really appreciated the support I received from Contech Engineered Solutions."